Composite image showing radio continuum emission at 610 MHz (in blue) from the region around HESS J1640-465 / SNR G338.3−0.0, and infrared emission at 8 μm (in green) and at 24 μm (in red) taken from the Spitzer Space Telescope GLIMPSE and MIPSGAL surveys, respectively. The white circle marks the position and extension of HESS J1640−465, while the cross indicates the location of the extended X-ray source (Lemiere et al. 2009). From Castelletti et al. (2011). The very high energy (VHE) gamma-ray source HESS J1640−465 (SOM March 2007) was discovered by H.E.S.S. 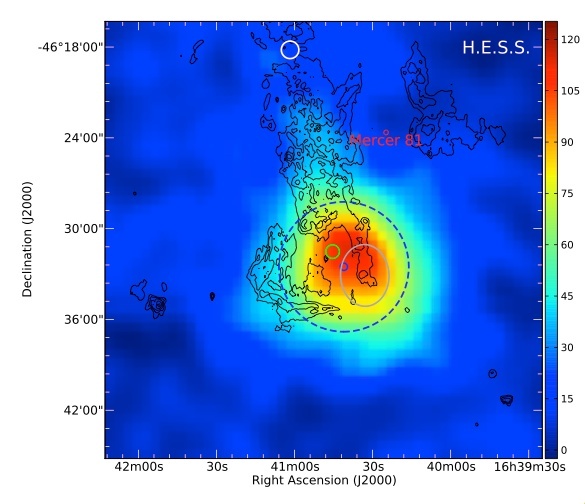 in the Galactic Plane Survey (Aharonian et al. 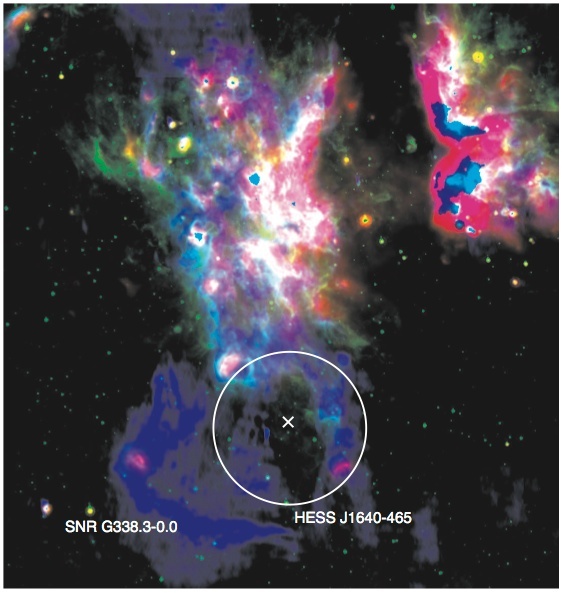 2006) and is positionally coincident with the supernova remnant (SNR) G338.3−0.0 (see top image). Using XMM-Newton observations Funk et al. (2007) detected an extended X-ray source (XMMU J164045.4−463131) close to the geometric centre of the SNR and within the H.E.S.S. source. The X-ray and VHE gamma-ray emission components were initially interpreted as radiation by relativistic electrons in a pulsar wind nebula (PWN). Observations with Chandra confirmed the presence of the extended X-ray nebula and identified a point-like source which was suggested to be the associated pulsar (Lemiere et al. 2009). 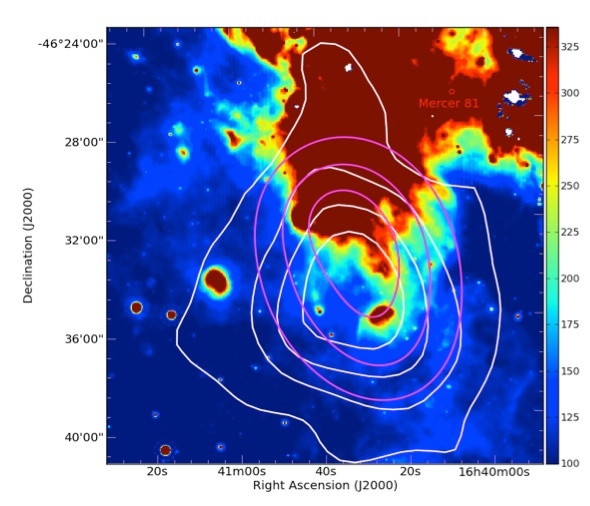 Fermi-LAT data revealed a high-energy gamma-ray source coincident with HESS J1640−465 (Slane et al. 2010). The distance to the remnant G338.3−0.0 is estimated to about 10 kpc; radio line emission indicates rather high gas density in the shell, of up to 600 atoms per cm^3. Since its original discovery, the available H.E.S.S. exposure towards HESS J1640−465 has quadrupled and advanced analysis methods are now available that allow for a much more detailed spectral and morphological study of the VHE gamma-ray emission. Fig. 1 shows the new gamma-ray image of HESS J1640-465. The VHE gamma-ray source encloses the northern part of the SNR shell of G338.3−0.0, the candidate pulsar wind nebula and the Fermi source. The intrinsic size of the H.E.S.S. gamma-ray source is about 4'. Fig. 2 shows the emission spectrum of the source, from radio to VHE gamma rays. Given the now available multi-wavelength data, it turns out that the hypothesis of a pulsar-wind origin of the gamma-ray emission is difficult to maintain; size and spectra (Fig. 2) of the source favor emission caused by interaction of supernova-accelerated cosmic rays with the dense ambient gas, in particular in the northern section of the remnant (Fig. 3). With a distance of ~10 kpc, the high gamma ray flux makes HESS J1640-465 the galactic remnant most luminous in very high energy gamma rays, with a TeV luminosity of about 5x10^35 ergs/s, and an energy of a few 10^51 ergs estimated in accelerated cosmic rays. Fig. 2: Spectral energy distribution of HESS J1640-465 based on H.E.S.S. very high energy gamma ray data, Fermi high energy gamma ray data (Slane et al. 2010), X-ray (Lemiere et al. 2009) and radio data ( Castelletti et al. 2011). 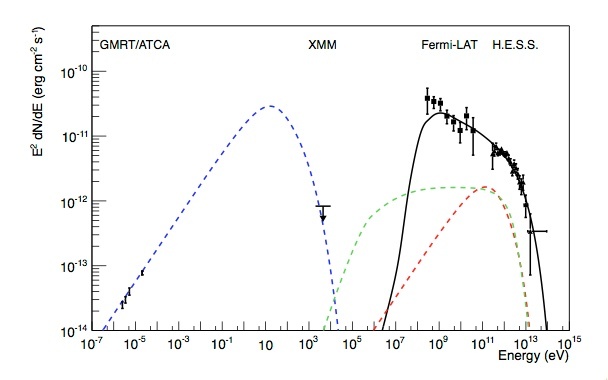 Dashed blue and red curves show synchrotron and Inverse Compton emission from non-thermal electrons, respectively, whereas the solid black curve models hadronic gamma-ray emission from decay of neutral pions produced in interactions of accelerated cosmic rays with ambient gas. Fig. 3: Spitzer MIPS 24μm infrared image with overlaid contours from the smoothed H.E.S.S. excess map (white). The infrared emission essentially traces the abundance of interstellar dust and dense HII star-forming regions.